SYNOPSIS: When George and her colleagues get a new boss whose focus is on moving souls quickly and enjoying life without consequences, the team begins to break the strict reaper rules. While her friends fall victim to their desires for money, success, and fame, George breaks another rule by revealing her true identity to her living family. As the reapers struggle with their roles on Earth, they each find that death can be just as complicated as life. Through its strong storyline, Dead Like Me delves into the intricate mythology and dark comedy created by the TV series and appeals to the show’s legions of fans as well as those new to the world of the reapers. REVIEW: Dead Like Me was a comedy drama TV series that aired in Showtime from 2003 to 2004. The show had a creative and well developing story, humor, some drama , and very good acting that in my opinion had everything to be extended at least two or more seasons that unfortunately for many fans the series was cut short and unresolved leaving the fans expecting for more. 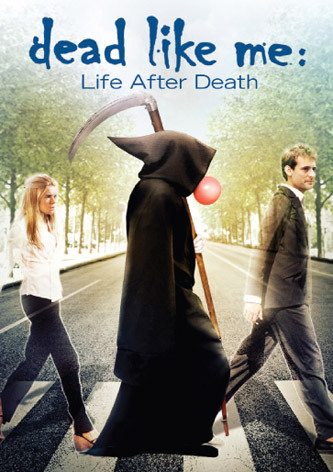 Fortunately, aster 5 years of waiting all the uncertainties left in the series are going to be answer, well.. Not really, but at least Dead Like Me: Life After Death , a full length movie based on the show, will leave the fans with a better feeling than the inconclusive second season. As I was watching the movie, I could not helped to relate it to the show, as matter of fact I did not feel that I was watching a movie, but just a long episode of the series. Nonetheless, I was pleased, the director was able to re introduced the characters and situations from the series in to a new audience without creating a feeling of repetition and annoyance to already fans of the series. Also the same style from the series was kept where we have George reflecting as the story progresses, also that they kept a sort of timeline where all the characters have evolved since the last time it was aired. From the beginning of the movie the audience is transported to George’s universe and it is kept satisfy to the end. This is also helped for the returning cast performance. Ellen Muth, Callum Blue, and Jasmine Guy, conserved that undead chemistry that made fans fall in loved with them and the series, also Britt Mckillip, and Cynthia Stevenson and specially Cristine Willes gives the audience the best drama and humor that keep us in a non ending happy time. Unfortunately, the movie has major flaws that might annoy returning fans, first the writers omitted major pre- establish rules that were set during the series and added more to the conflict of the main characters, specially the one involving the relationship between George and her family. Also the story is not delivery correctly, as it begins with a promising plot as it develops some of the characters main characteristics are distorted to an extreme point and when they try to bring everything to normal everything looks too forced. And the number one flaw of the series is called Daisy Adair, who is interpreted by Sarah Wynter is the major disappointment the movie has. Sarah is a talented actress but somehow she fails to fill Laura Harris shoes with her performance as one of the funniest characters. In some scenes she looks as she is not even trying, in other she is just trying too much, looking goofy and silly. It would have been better that the producer and writers would of taken the same approach as they did with Rube (Mandy Patinkin) and introduced her as a new character. For some reason she lacks the chemistry that the other three reapers had. Overall, I think this is a movie that everyone would enjoy. I think fans of the series would have split opinions about this one. Personally, I liked the movie, it was gratifying seen this characters one more time. The story is kind of shaky and some performances are not as good as the original, but keeping in mind that it has been 5 years since the last episode, I think that the main story was kept intact, although the ending appears to be the ultimate ending for the series, I hope a follow up DVD or show is on its way. I recommend this movie to everyone who enjoyed the show, so they can come out with their own conclusions, also to people who have not knowledge of the series and enjoy cynical and smart comedy, it’s a good choice but I recommend to check the TV Show first to learn the mythology behind it. SPECIAL FEATURES: The DVD come with the usual making of featuratte, which could be fun to watch if you are a fan of such things, it has interviews with all the cast members and their opinion and comparisons between the movie and the show.